The Canon EOS C200 Cinema is the perfect camera for serious video or cine production with full 4K capability. The Canon Cinema C300 Mark II offers stunning 4K video capture and 4:4:4 RGB 12-bit colour rendition. Experience the quality to realise your vision An 8.3MP Super 35mm CMOS sensor, designed and m.. 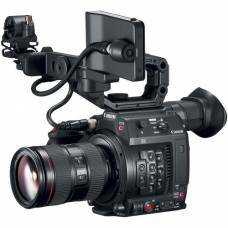 The Canon EOS C200 Cinema is the perfect camera for serious 4K video or cine production. Get it with the 24-105mm Lens.